Overall Dimensions: 10'8" W x 20' L x 9'9"
The King Canopy series is designed to be highly versatile, enabling customers to have a product that can easily adapt to whatever their needs happen to be at a given point in time. 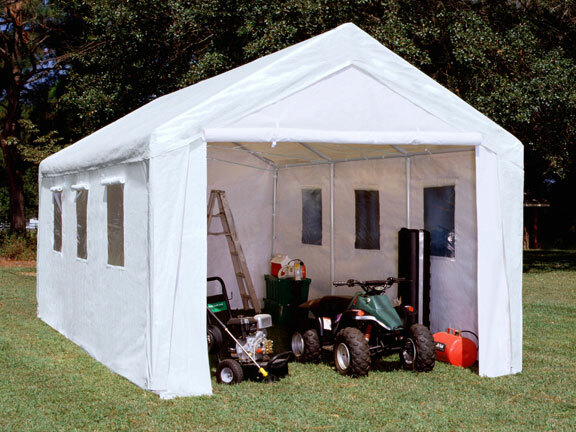 With their 10 foot by 20 foot Hercules Enclosed Canopy Shelter with Windows and Snow Load Kit, you have a tool at your disposal that can be modified in accordance with whatever your needs happen to be at a given moment, making sure that you can do whatever you need to do. King Canopy Hercules canopy shelter is actually a 4 3/4 but you don't have that option. Only improvement I could suggest is to make the outside corner pieces slightly wider or at least provide a means to velcro them to the body of the cover. We will probably end up using two sided tape to keep them secured to the main sections of the shelter. Other than that, it's very well made.